“This thing should have seatbelts,” I think as I plant myself in the empty helm chair next to the captain. We are gathering speed in Miami’s Biscayne Bay, 35 knots, 40, 45 and climbing, throwing an attention grabbing rooster tail 30ft in the air behind us. 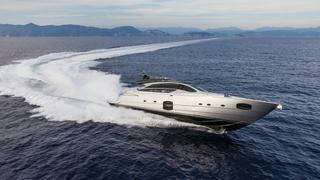 I am enjoying a front row seat on a 25 metre Pershing 82, from the brand whose sole objective is to go very, very fast. But this is no ordinary 82. The mid-40s top speed of the five-year-old model wasn’t quick enough for one American client. Working with him, Pershing developed this VHP (for “very high performance”) rendition that will reach 52.5 knots. After unveiling it in early 2017, the company has built eight VHP models, four of which have gone to the US market. I received an invitation to break the 50 knot barrier, “without spilling my champagne,” so I had to test that, of course. After all, this is a yacht that calls for bubbly. I take an experimental sip of my before-noon libation (it’s OK – this is during Art Basel). Yep, the Veuve remains steady in the flute. It is surprisingly comfortable inside at speed, though “inside” isn’t quite the word for it. It doesn’t feel at all enclosed as the glass bulkhead that separates the open plan main deck interior from the aft deck recedes completely, creating one continuous space. Fresh air circulates without mussing the hair. There’s also a sunroof over the helm but the captain opts to shut it when we leave the sedate cruising of Government Cut and cross under the Rickenbacker Causeway. The illusion is partly down to the power plants responsible for the speed boost. The 16V 2000 M96Ls are MTU’s latest tier three engines and very quiet considering they are generating 2,600 horsepower each. 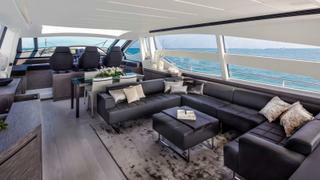 The place you don’t want to be at 50 knots is the flybridge, where you could literally be blown away. The top deck, with its pop-up navigation console, is quite low profile, hence there’s not much of a windbreak. At the main deck helm, corporate captain Damon Lish smiles. “There’s no way around it, she’s just a fun boat to drive,” he says as, with fingers on the tiller, he takes a sharp turn at 40 knots. We heel like a sailboat and cross our wake with nary a bump. So much of the yacht, including the propellers, is out of the water at this speed. If the vast bathing platform wasn’t concealing them from view, you could see the props breaking the surface, thanks to the Top System surface drives. But you don’t need to know anything about the drives to take the wheel though; Autotrim can do it all for you. 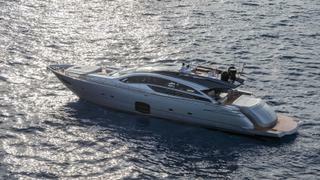 When the Ferretti Group revisited the 82 model to increase the performance, it also took the opportunity to add a new layer of Italian luxury to the interior. Poltrona Frau furnishings and leather stand out among the dark and pale-streaked oak backdrop. The guest heads feature striking Bisazza-tiled showers and Antoniolupi basins, and the master is accented with a metallic patterned wallpaper by French technology power company Elitis. 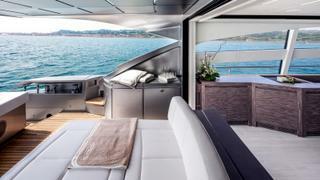 Expansive windows in the forward VIP and amidships master make it obvious that you are directly on the sea. I particularly appreciate the textured flooring on the main deck, a Pershing hallmark, which securely grips the feet. The hull I am cruising on includes a media lounge, which takes the place of a fourth cabin, and makes a pleasant landing spot when going below. Another gathering place is the foredeck, which has a large sunpad forward of a table and seating that can be covered by a canopy. I had arrived at the boat in the morning via the mayhem that is driving into Miami at rush hour. Like me, the Pershing 82 VHP also left Fort Lauderdale that morning and, even with a brisk wind churning up the Atlantic, it makes it dock to dock in less time – its cruising speed of 45 knots (52mph) far exceeding my plodding progress down Interstate 95. I’m sure it was a heck of a lot more fun too. First published in the February 2018 US edition of Boat International.